The displaying of works of art in a hotel is nothing new; in fact, quite a few luxury establishments boast impressive collections. One example is Zurich's Dodler Grand, which has more than 100 works of art from the owner's private collection on display, including pieces by Salvador Dali and Damien Hirst. 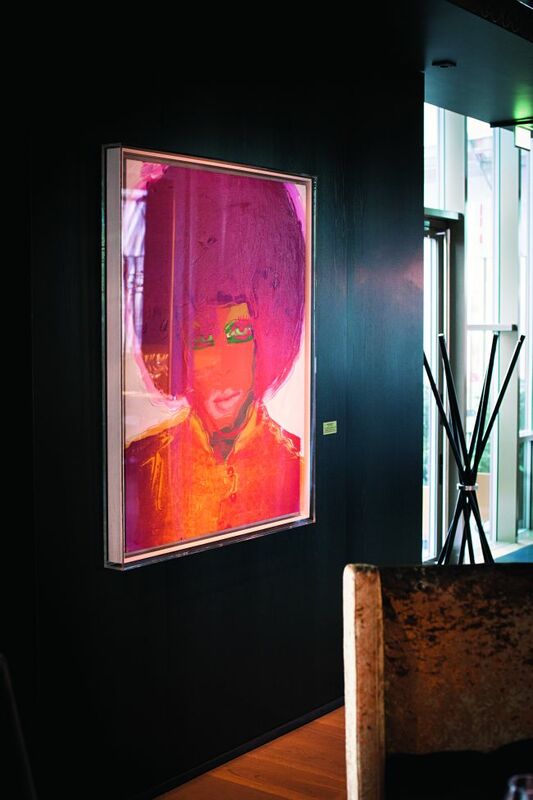 New York's Gramercy Park Hotel also has an expansive collection, its walls adorned by names such as Basquiat, Hirst, Warhol and Haring, among others. The opening of the Oslo design hotel The Thief earlier this year, however, is something special. It is located in Oslo's waterfront neighborhood of Tjuvholmen, directly across from the new Astrup Fearnley Museum (home of the Astrup Fearnley private collection), which opened just last year and was designed by the architect Renzo Piano. A special arrangement exists between the museum and the hotel that allows for part of the hotel's exhibition to be sourced from the private collection of the entrepreneur/collector Petter Stordalen, and another part to be loaned from the museum (including a Warhol which currently hangs on one of the restaurant's walls). This way, the hotel – which was designed to display works of art – can regularly change its displays. At first, the hotel's name may seem like an ironic nod to the 1960s film “How to Steal a Million”, or, a sarcastic take on the legendary heists of Munch's “The Scream” (versions of the painting have been stolen twice – from Oslo's National Gallery in 1994, and from the Munch Museum in 2004). Actually, the hotel's name was inspired by its location – the small peninsula on which the hotel and the museum now stand was where, in the 18th century, the city's thieves were both incarcerated and hanged. The hotel's staff do not hide the fact that this is one of the most highly insured hotel art collections in the world. In front of the glass doors of The Thief sleeps a cast-iron man, bent over as in prayer – also known as Draw, by British sculptor Antony Gormley. 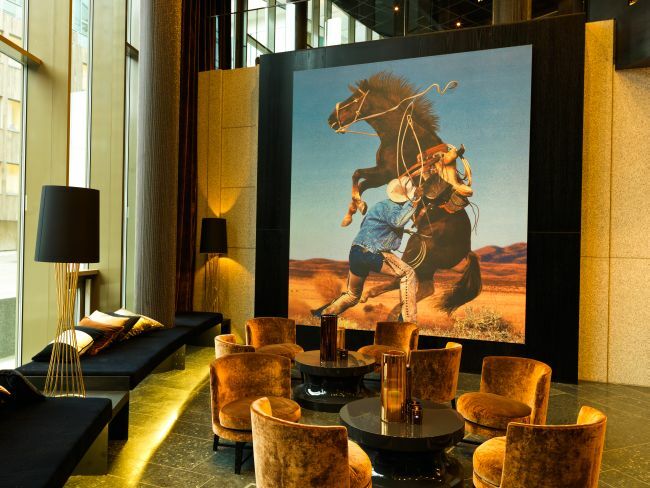 The lobby, in turn, is graced by Richard Prince's gigantic lithography Cowboy – The Horse, Niki De Saint Phalle's Le Grand Rossignol, and Tony Cragg's Subcommittee. 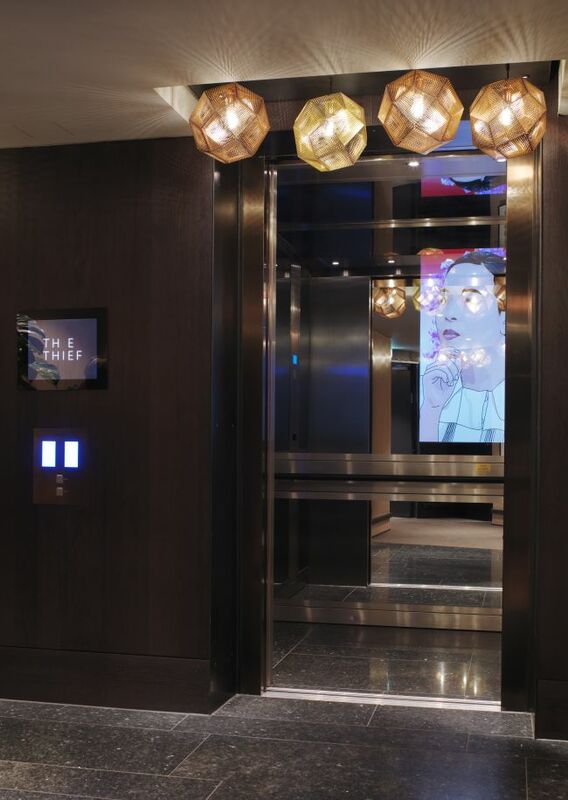 Art can be seen everywhere in The Thief – in the common spaces, in guests' rooms, and even in the lift, where guests are accompanied by another inhabitant of the hotel – a mobile video-installation by the British artist Opie Julian. In my seventh-floor room, Kate Moss gazes upon my bed – she's the subject of a work of art (Shameless, 2010) by Brian Ferry of Roxy Music-fame, and just one of a series that make up Ferry's legendary album covers. Although the photographs were taken by various well-known photographers (in this case, by fashion photographer Adam Whitehead), Ferry styled the shoots; in interviews, Ferry prefers to call himself “a successful artist”, rather than a rock-musician. 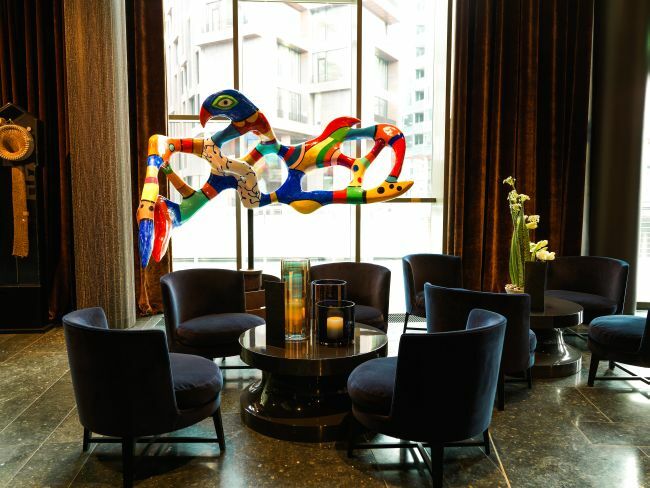 Overall, the hotel's collection has ten pieces by Ferry – just as many as by the classic British pop-artist, Peter Blake. Blake has a special relationship with the capital of Norway – last year the Oslo gallery Stolper+Friends hosted an exhibition of his titled “The Oslo Suite”, which contained works inspired by the landscape and iconography of Norway. Some of these works are now a part of the The Thief's collection, the hotel even having named it's most prestigious room “The Oslo Suite”. One of the gems of this room is a photographic portrait of legendary Norwegian ice-skater Sonja Henie (who also happened to be an art collector and co-founder of the Henie Onstad Kunstsenter museum). Blake has given the picture an added dimension by accenting the cloud of ice shavings – made airborne by the sharply turning blade of the skater's ice-skate – with diamond dust. In total, 105 pieces of art are on view in the hotel, and it is precisely the confidence with which the displayed works were selected that sets The Thief apart from other hotels, many of which use art just as a decorative element or as a marketing trick. In The Thief, the art is a part of the establishment's circulatory system; the works have been integrated like a fine piece of emotional dramaturgy, virtually bringing the hotel into the dimension that is usually reserved for art galleries. The hotel's display has its own curator, of course – the Swede Sune Nordgren, former director of Norway's National Museum of Art. We spoke to Nordgren about the principles used in creating the collection, as well as the added dimension that the collection has from being outside of the usual context of a museum or gallery. On a side note, guests of the hotel can visit the Astrup Fearnley Museum free of charge, by simply presenting their room key. What was the main challenge in working on this project? In the collaboration between the Astrup Fearnley Museum and hotel The Thief, the main challenge was to lift very well-known art works from the pure and protected museum context and into a heavily-designed interior. The luxurious concept of The Thief is almost domestic, as if I had been asked to arrange the art works in a collector’s home. A few of the spaces in the hotel, like the lobby and the restaurant, were left to my disposal, but for most of the works I had to find the spaces after the interior design was finished. Normally, I am the last to get access, so I am used to turning things around fairly quickly. For the art that I acquired for other places in the hotel, like practically all of the rooms, I concentrated on paper-based works like prints (photography, graphics), but of the highest quality, and by both Scandinavian and international artists. Another challenge was five floors of windowed staircase landings, a fantastic opportunity which I solved with works from the Stordalen Collection, as well as with a new acquisition (by Camilla Løw). How important, from your point of view, is it to bring art outside of the context of museums and galleries? It is important to make art works interact within different surroundings. I see it as a kind of test of the sustainability of the art. It has to be able to take the competition without just being spectacular. But it can also be an opportunity to find new audiences and to trigger new interest in the art. Art, undoubtedly, adds additional value to the hotel, but is there some extra dimension which the hotel could bring to art? It could bring a different way of experiencing the artworks. In a gallery, you are kind of exposed yourself, but in a hotel, you can be really relaxed with the situation and give the artwork more time, another chance. Could hotels become the new galleries? I do not see how they could replace each other. They are more complementary; they have different ways of focusing on the art works. A private gallery provides a focus that is more commercial, while the museum provides more of a background that places the art work into a wider context; the hotel is a more “domestic” experience. It is interesting to see how the same art work can appear differently, and evoke slightly different “meanings”, depending on its environment. How do you select the artists (and works) which are displayed at The Thief? I wanted the works, that I had the opportunity to select from the Astrup Fearnley collection, to be well-known and established names, so as to provide an indisputable prestige that would enhance the profile of The Thief as an “art hotel”. In terms of the art works that I purchased specifically for the hotel, I wanted to introduce some younger Norwegian artists, like Charlotte Thiis-Evensen (video) and Camilla Løw (sculpture), but I also played a “safer game” with artists like Peter Blake and Julian Opie. The agreement between The Thief and the Astrup Fearnley Museum foresees that The Thief can borrow signal works from the museum's collection. How often do you plan to change the artworks which are exhibited in the hotel's most strategic locations? The frequency has not yet been decided. It is partly a question of whether the museum needs the works for their own displays; and there is also a financial aspect. The works I have chosen require precise and pretty complicated installations, so I would prefer that the art works stay for a substantial length of time. Perhaps we'll shift a few – not all – after a year or so. We also borrowed video art from the museum, and these are available for viewing on the interactive TV sets in every room. These will also be changed in due course. 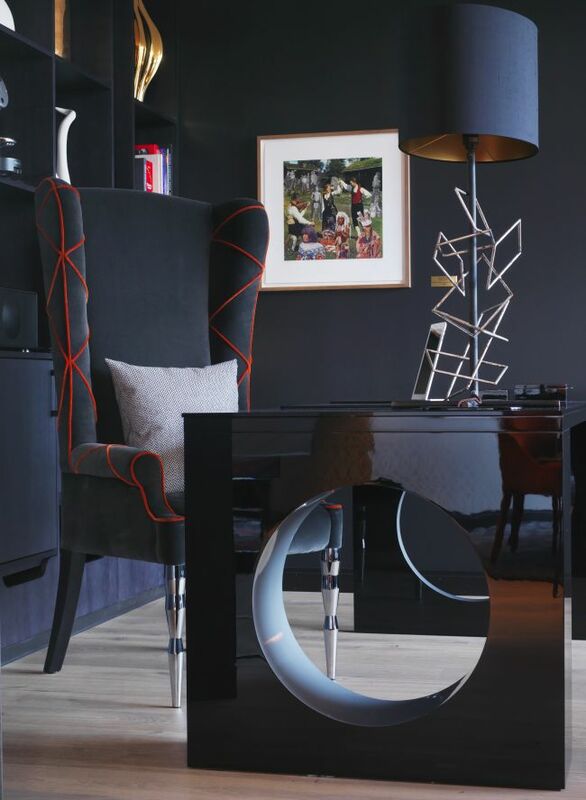 It is my idea that art works in a hotel can last for quite a long time; most guests are new, and for returning guests, it is a way of welcoming them “home”, since the art definitely is a strong part of the hotel's identity. As the owner of the hotel said in an interview: “The challenge here is to work with an unprepared audience.” Is there any chance that a couple of nights spent in an “art incubator” – and between the hotel's satin sheets – could inspire some of The Thief's guests to become passionate art patrons? I could not have said it better myself. Let’s hope you are right about that. Thank you.